Could you replace my game's description with this, please? 1.5 years after the events of Apollo Justice, Phoenix has retaken the bar exam and been permitted to become an attorney once more. He finds himself involved with a series of cases, all apparently connected to each other and all somehow tying back to his new prosecutor rival, Obadiah Williamson. Can Nick unmask this conspiracy of lies, forgery, and betrayal? Or will he too become corrupted by it? Features an overarching story and complex plotlines covering five large cases. 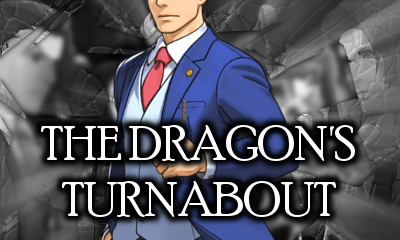 Contains spoilers for Apollo Justice and Trials & Tribulations. Newest Update Announced: The fourth and fifth cases are in the script-writing stage. Due to the intertwined nature of their plots, they are being worked on simultaneously and will be released around the same time. Expect another year or two before they are out. Box Art WILL be subjected to change. 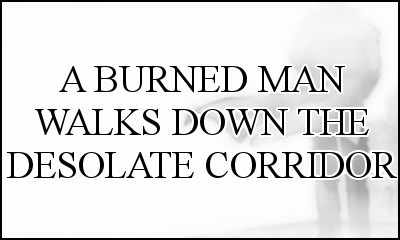 On a parrallel universe, Apollo's client, Vera Mishram has been given the verdrict of Guilty. But before she got her punishment, she died of poisioning. Apollo became depressed, left Phoenix and Trucy, and took on his own road. After a year, Phoenix has retaken the bar exam and been permitted to become an attorney once more. But, a series of cases come at him. Some familiar faces emerge in suprising possitions. 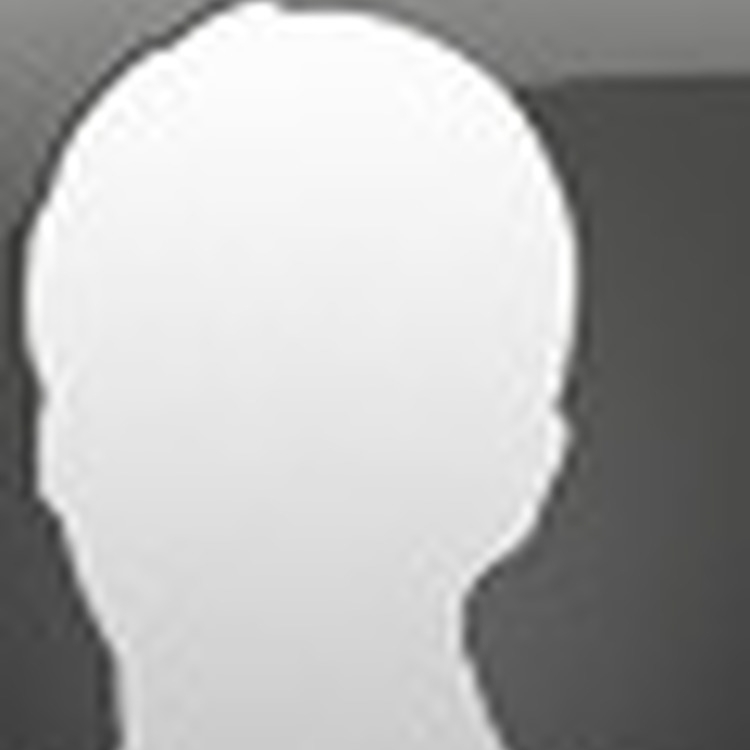 Functions Currently Supported: Cross Examination, Psyche Locks, Better Resolution. the most accurate Ace Attorney gameplay functions that the program will be able to provide. 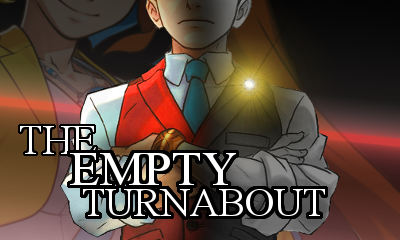 Turnabout Generations author here. With the release of Part 2, I'd like my fancase added if you don't mind. "The new generation must succeed the old." It's been a couple of months since the case of Vera Misham, and Apollo's been eager for a new case, and has been awarded as such when he finds out a high-profile authority has been murdered! He takes the case immediately. The defendant turns out to be one mysterious, cool-headed client... what's his role in all of this? 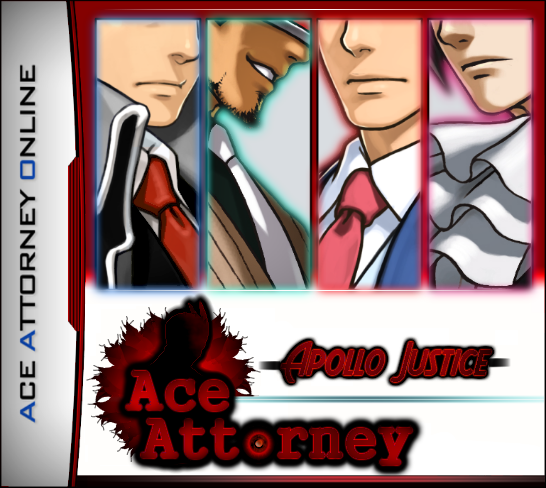 Apollo's facing some serious competition: a new judge, along with a new prosecutor on the block, and everything and almost everyone against his side, this will be his toughest case ever! Can he pull through and defend his client? 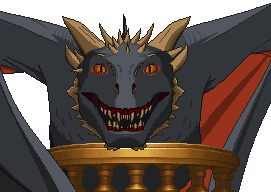 Additionally tried to clean up the thread in general, dividing it into active/inactive fangames. Hey, could you please add this in (preferably near the Pywright section). A tutorial for those interested in making a game in Pywright. Turnabout Awesome and Turnabout Awesomer are a (so far) two part series designed to help rookie coders learn to write in Pywright. They explains everything simply in laymen's terms so that even somebody with no programming experience should be able to learn from them. The perfect place to start if you're looking to make a game, but have no idea how to write it. The first tutorial can be found in the "Pywright Tutorial" thread on this very forum. It covers the basics, such as starting up your new game and writing very basic scenes. It has several pictures, to show how everything should look. The second is downloadable and interactive. It covers more intermediate material and is a good place to look once you've familiarized yourself with the stuff in the first. Newest update announced: Updates will be made, depending on how much difficulty people are having with various concepts. Feedback is greatly appreciated, to have this give the best learning experience possible. I don't know if I'm asking at the right place, but which fan games are considered "finished" (as in, completed and no further updates and additions planned)? Morgan Wright, now finished with law school, comes to visit his brother Phoenix, what he didnt know is that he would be thrown into a mess of cases, along with a prosecutor to boot, can Morgan solve these cases and clear his client's names? Newest Update Announced: Case 2 is currently in the works. 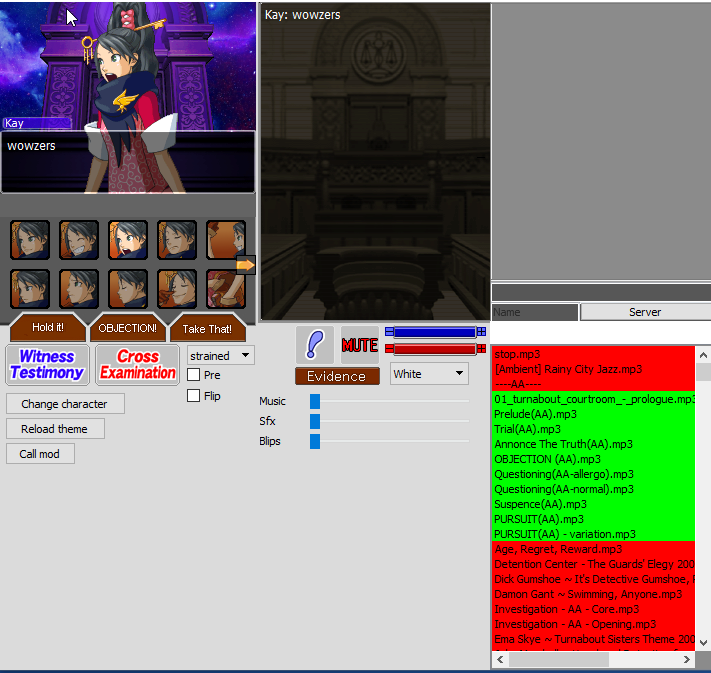 Functions Currently Supported: Case 1 is fully playable, featuring only courtroom scenes. Also, I noticed on the first page that Papermario didn't want to have more than one project per person in this list. Are we still doing that? I'm currently writing the script for. Anyone interested in spriteing and voicing characters PM me. I have one, but it will be one case at a time. Only a few things needed, like Athena Cykes defense bench sprites and cover art (and i need to learn how to make a trial series. :l) Sprites and animated too. 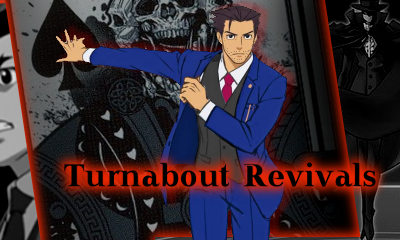 I'm also making a case (just one, not a game) in Ace Attorney Online. I wrote it along with two friends. It's still in development, but when it's finished; I'm sure it's gonna be awesome! It's called... 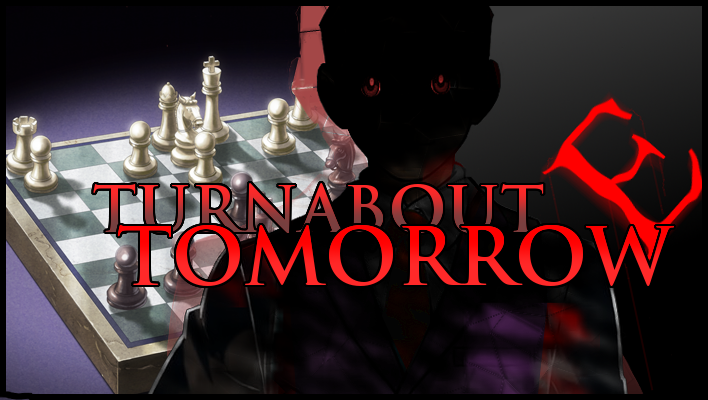 Turnabout Restaurant. Well, hello. I wanted to make a case with the Phoenix Wright Case Maker and I've learned how to introduce characters correctly (when I introduce, for example, Ema Skye, she comes to scene and everything's all right). But the thing is that when I want to introduce Klavier Gavin , having downloaded the gifs from the media of court-records, some intermittent blue color appears around Klavier and I would like to know how to fix this and if I can't, where I could get Klavier's gifs that work. Sorry if this is not the most appropriate thread to post this and Thank you! 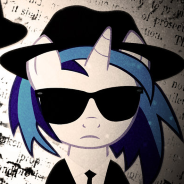 Well I'm not sure I'm up to developing a fan game on my own, but I'm interested in teaming up with someone maybe as a co-writer or something. I'm quite big into howdunnits and think some of my ideas would be great for an Ace Attorney game. How should I go about finding someone to collaborate with? Sorry, I'm not sure where to post this. I need collaborators for a case I'm making for Godot called Turnabout Jazz. The main idea for the project is that its a case for Godot and It replaces all the back ground music to jazz versions. I need anyone who can handle animations and designs like through gimp or photoshop, or someone to atleast try lol and also help me out on the story ideas and grammar. I had this idea for quite a while, I'm looking for anyone who is willing to help for the sake of . Percentage wise how far I am to finishing the game is like 45% if I don't add any other ideas. 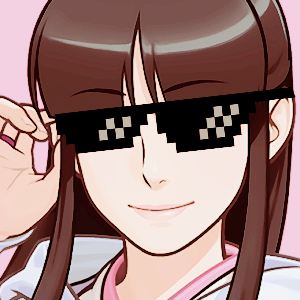 I'm no liar I actually worked on the project, part of it is done on ace attorney online if you wanna check it out just ask me its not entirely done so its in demo. I feel like Capcom made it too sad for Godot and he needs something to redeem himself so that's what this case is for. 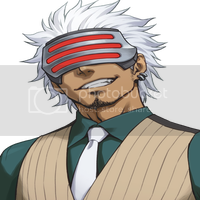 After the last case from Trials and Tribulations Godot returns to be an attorney and takes on a case with Phoenix, your defendent is a famous jazz musician who is accused of murdering another famous jazz musician. The prosecutor for the case is young Klavier Gavin, The best old cool vs new cool battle. This is my image for a possible game. Features an overarching story and complex plotlines covering five large cases. 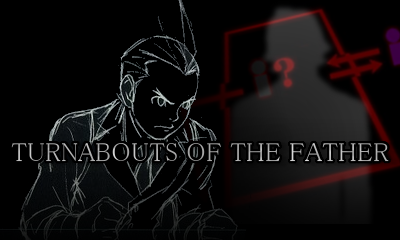 Contains spoilers for Apollo Justice, Justice for All, and Trials & Tribulations. This is a rather lengthy game and a typical playthrough will probably come out to around 30 hours long. Newest Update Announced: Conflict of Interest is complete. If players run into bugs I will update the game as needed. I'm afraid I no longer (I mean, I haven't in some time, admittedly) have the time or frankly much desire to manage this thread, so I'm hereby looking for someone to transfer ownership to. Please post here if you're interested. Last edited by Ropfa on Tue May 09, 2017 5:51 am, edited 1 time in total. And yours it shall be, then. I'll ask BP or someone to transfer the ownership. 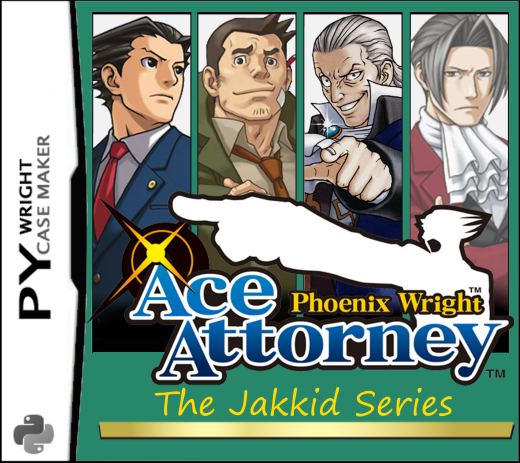 Phoenix Wright gotta defend everyone and I mean everyone in this 10-case-long game set in an alternate universe known as the Jakkidverse. Based on the Ace Attorney fanfictions of Jakkid166. Said to be a true story. 500% serious. Newest Update Announced: It's all there. 100% complete. All 10 cases. Functions Currently Supported: Psyche locks, fingerprinting, battle. So yeah you'd be the best man on CR if you could put that in the original post, friend. One thing I'm gonna be doing is to sort the cases based on whether they're completed, partially complete, or still in development. But there are also some cases in that list that I'm going to be completely removing. Some of the people who announced cases in that first post haven't been active in months or even years. Some cases were flat out cancelled by their creators and others, as far as anybody can tell, never made it past the "this sounds like a fun idea" stage. I'd like for this list to mostly just consist of games that have either been completed, partially completed, or that there is visible evidence that they are still being worked on. (If I remove your game and you feel this was unfair, please send me proof that you are still working on it and I will put it back up). Not to rain on anybody's parade, but I really feel like this thread will do the overall fan community more good if it lists stuff that people can actually play, rather than "what could have been." This can also hopefully help people putting in a legitimate effort to complete their fangames to find help in getting resources. I have always strongly disagreed with the "only one project per person" rule in this thread. If you've made more than one fan case, feel free to submit all of them. This community is hungry for games! I think the "one fancase" per person was placed there during an era where people were still more about the idea stage rather than actually making stuff. With your new criteria for adding stuff here, it'll make much more sense to remove it, yeah. Recently, I happened to come across and take part in a discord server dedicated to making and building fancases across all three major engines. I think it could be beneficial in terms of building an actual community and improving communication between authors and players even more. It's been suggested to me that instead of giving it its own thread here, it's placed in this OP. Which I suppose, comes down to whether or not Ropfa wants to put it in. I personally think it could be a good resource either way. Here's the link, if anyone happens to be interested: https://discord.gg/BKdp4Pm. If you have any suggestions or ideas on how to improve it, they're more than welcome. I noticed that Attorney Online(not Ace Attorney Online....) is absent from the list. Is it possible to have it added? It's basically Ace Attorney multiplayer. Not really a case engine or a case engine project, but I guess it qualifies as a fan project. I've gone through and sorted the list and removed several games that had not shown any progress in a long time. If I removed your game and you feel that this was in error, feel free to send me a PM with visible evidence that you are still working on it and I will put it back up. But I do not want this thread to get flooded with a bunch of "good ideas" for fan cases that are never going to be completed. Also, as I mentioned, I'm changing the "only one project" rule. If you have made more than one case, feel free to submit all of them. Shortly after a dangerous convicted serial killer escapes captivity, a city-wide manhunt is launched. Unsurprisingly, though, murder inevitably occurs - in the top floors of an employment office. What is surprising? The victim is the serial killer. Taking place in an alternate universe, Apollo Justice is a determined and up-and-coming lawyer, competent enough to work on his own. Unfortunately, his normal life is disturbed after he's no less than tricked into taking a case no sane man would have ever taken. With a prosecutor not in the mood for playing games and Apollo's own past demons seeping into the trial -- will justice be served? 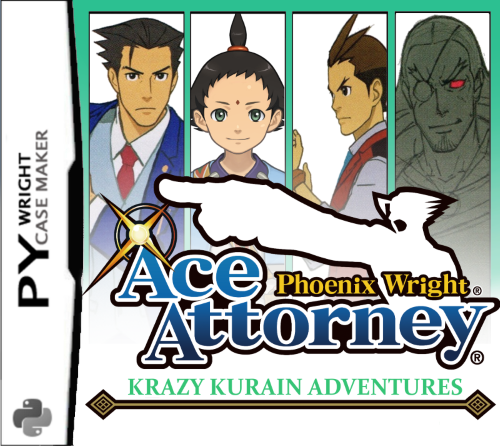 Taking place in an alternate universe where Apollo Justice continued... in a somewhat different direction. Apollo's seemingly normal life and bright future is suddenly brought into crisis as he takes the case of a young lawyer -- Athena Cykes. Somewhere deep in the cold mountains of western Japanifornia, in the midst of the night, a man speeds on his snowmobile. He can't see anything before him. Yet, he isn't afraid. He's used to the danger. In fact, he adores it. Every aspect of his live has been based around it. He drives with no particular destination in mind, unaware that a destination has been set for him already. By next morning, the man will be dead. His death will quickly prove to be a mystery to all but one man -- detective Joseph Sternwood. Unravel the hidden chapter in the Phoenix Wright saga. Well, we don't talk about him these days. Obviously, Dual Destinies is not in continuity here. Taking place several months after the events of Spirit of Justice, Phoenix finds himself alone when he takes a rather strange -- and extremely hopeless case. With an uncooperative defendant, a staggering amount of evidence supporting the police's case, and a prosecutor that clearly has it in for him, how will Phoenix turn things around? Is there even any room for doubt? In the hearts of the key players, all with their own secrets and motives? Between the trees of the dense forest, the scene of a horrific murder? Or perhaps, in the mythical city of gold that seems to be the connecting factor between the strange circumstances of the case -- El Dorado? Newest Update Announced: Part 1 / 3 released! the award ceremony is in town! 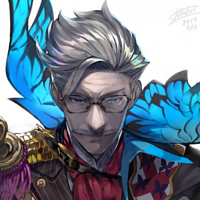 its the awards for the world festival that is run by the famous man from khura'in, yuh'ar ah'winneh, and he is giving awards including the award of lawyering for the best lawyer in los angeles! but if phoenix doesnt win that award his life may shatter into absolute CHAOS! can phoenix beat apollo and become the best lawyer in los angeles and win the prize or will he and his friends die as he tries to?? More shitposty stuff, but maybe a serious thing will maybe come soon maybe. To lurk, or not to lurk. It'd be cool if someone could add my WIP fangame. 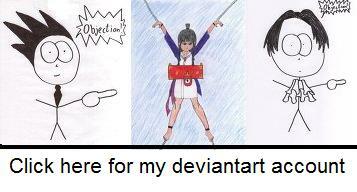 Phoenix Wright, legendary defense attorney, a name any defendant can trust openly (well, almost any defendant). 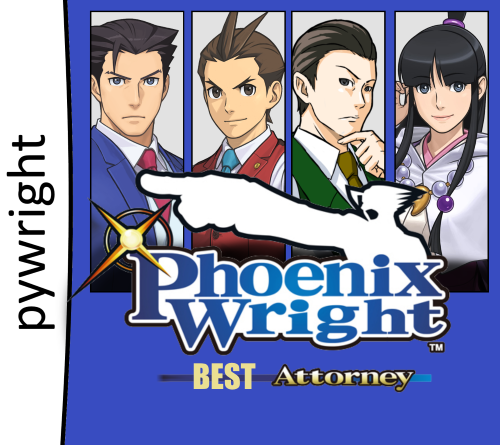 Mr. Wright has experienced everything that the law could possibly throw at him. With years of experience, pre- and post-disbarment, it isn't a surprise to many that Nick has experienced the ins and outs of the courtroom to the point of near predictability. Until his return home from abroad, that is; that's when everything changes. Life spirals downward as Phoenix finds his sanity slowly beginning to fade almost immediately after being thrust into a series of cases upon arriving in the states from the Kingdom of Khura'in. Will Phoenix be able to turn around the overtaking insanity? Or will the true darkness the law has kept hidden for so long be brought to light and bring his whole world crashing down on him? Newest Update Announced: Case 1 ~ Part 2/2 is near completion. I've come back and I've got a serious game this time, kind of. This is a fangame of a currently unreleased game that is like Ace Attorney. Set 5 years after Hexepta: Logic Hack, Argus has joined the Hexepta Legal Academy and wants to become a defense attorney. 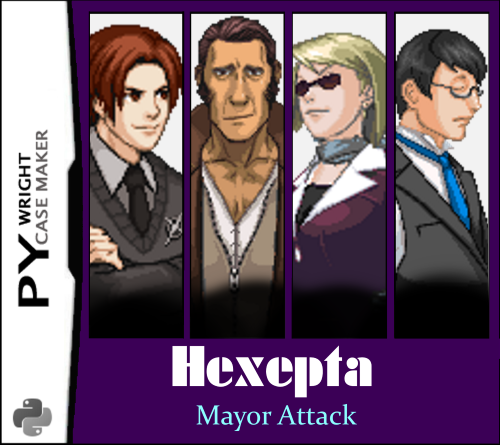 On his journey through the courts, he must help the unfortunate Mayor of Hexepta, who's become a target for many crimes. 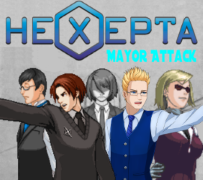 Argus must solve these crimes, protect the mayor and stop the madness from taking over Hexepta!